Bath, Maine’s City of Ships, experienced a dramatic boom in construction in the early part of the 19th century. The historic Winter Street Church is just one of the landmarks to survive from this period. Erected in 1843 in the Gothic Revival style with Greek Revival overtones, it was designed by architect Anthony Coombs Raymond and enlarged in 1864 with the addition of an Italianate-style parish hall designed by Francis Fassett. Twenty-five years later, John Calvin Stevens, once a student and later colleague of Fassett re-designed and oversaw the 1890 renovation of the sanctuary. The building complex, saved from demolition in 1971 by its current owners Sagadahoc Preservation, Inc. (SPI), is listed in the National Register as both a stand-alone building and a contributing building to the national and local historic districts. Since owning the complex, SPI has worked diligently to carry out steeple repairs, re-roofing and window restoration and, in 2014-15, the replacement of the heating system. Tragically, while the church portion of the complex was closed due to lack of heating and other considerations, a severe 2015 storm struck the region causing a large portion of the vaulted ceiling in the sanctuary to collapse. Sagadahoc Preservation then had to remove cartloads of debris and thoroughly clean the historic space. Part of its efforts involved identifying and saving portions of the remaining plaster ceiling to capture paint colors and stenciling work from the 1890 renovation and other periods, as well as removing remaining unstable plaster ceiling which reached 27 feet at its highest point. An RFP was put together and after a generous lead fundraising gift from Bath Savings Institution, several bids came in. Ultimately, Preservation Timber Framing, Inc., led by Arron Sturgis, was chosen as the construction contractor for Phase I. Not only did Sturgis bring extensive experience working with historic buildings and churches to this project, he also suggesting foregoing pricey rented scaffolding, and constructing wood timber-frame staging instead. This ingenious plan permitted workers to access the highest reaches of the ceiling from timber framing that will remain in place in anticipation of the day when the ceiling can be fully reconstructed. Arron Sturgis is an esteemed member of the Maine Preservation family, having served as both board president and a dedicated board member. His work in Bath with Preservation Timber Framing produced a practical solution that saved tens of thousands of dollars in rental expenses, met SPI’s pressing challenges, and exemplified how traditional craftsmanship can neatly address contemporary building needs. Named to honor Bath’s first casualty of World War II, the John E.L. Huse Memorial School was constructed in 1942 according to plans drawn by architect Alonzo J. Harriman, a native of Bath and founder of Harriman Associates. The school served the children of Bath Iron Works employees, a growing population that necessitated the addition of a new wing of classrooms at the North End of the building just seven years later. Huse thrived throughout the baby boom years, but the student population here and elsewhere in Maine gradually declined, and in 2006 the City of Bath shuttered the school. Regional School Unit 1 occupied the International-style building for several years, but when they moved out, the 33,000-sq. ft. community anchor began to deteriorate. Thankfully, the Szanton Company saw the value in the historic structure and purchased it in August 2016 with the intention of converting the space into residential apartments. While vacant, Huse School did suffer from the effects of water damage, broken windows and graffiti. Overall, however, the condition of the building was excellent—the original wood joists and masonry bearing walls were in very good shape. The hardwood floors, under several layers of glue, carpet, and pads, were also in amazingly good condition. With a firm plan in place to add a new wing and transform the historic complex into 59 affordable housing units, renovations began by exposing interior brick walls, removing small amounts of asbestos and lead paint, and refinishing the original hardwood floors. New roofing and insulation buttoned up the building and new walls framed the contemporary apartments. Modern electrical and mechanical systems were promptly installed. Today, the school retains its historic mid-century vibe with original signage at the 1942 front canopy, as well as period-appropriate replacement doors and windows. Common areas are sprinkled with memorabilia such as vintage classroom clocks, sections of original chalkboard, original blueprints, student murals, and historic school and class pictures. 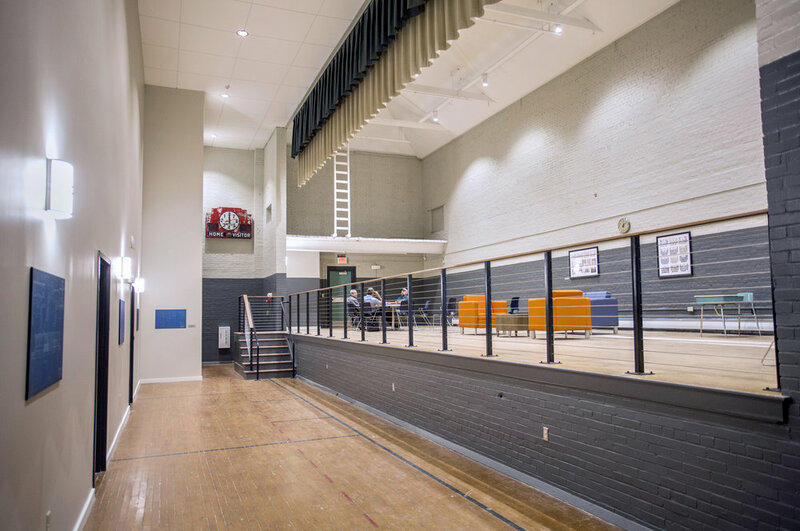 The one-time gymnasium was modified and converted into a common room and several two-story apartment units. Other amenities include a lobby with a fully accessible elevator, new entrances, and both fitness and laundry rooms. The Szanton Company did extensive site work to build a large, modern neighborhood playground, an expanded parking lot, landscaping that includes many evergreen trees, and new walking paths that feed into existing city trails. The community response has been overwhelming, and just a week after opening 78% of the units had been rented. This remarkable project honors the schools’ namesake and its historic character while providing much needed affordable housing for the deserving citizens of Bath.